DENVER—Two years after performing his 2011 spinal fusion surgery, doctors announced this week that Broncos quarterback Peyton Manning has been officially cleared to return to the field and take part in football activities. 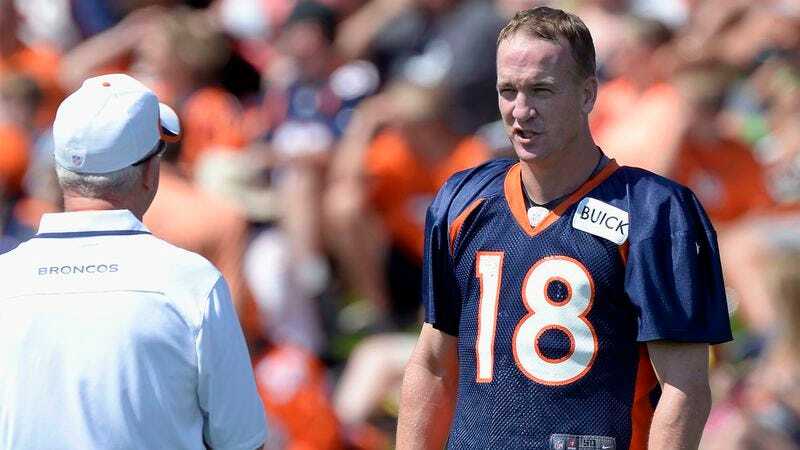 “We’re pleased to say that after a long recovery, Peyton has successfully passed all of our medical tests required to begin engaging in full-contact drills,” said Dr. Alan Killough, who went on to praise Manning’s determination to come back ahead of schedule, adding that a year ago he doubted the signal-caller would even be able to suit up for the 2013 season. “Now, while we’re excited for Peyton, it’s important that we monitor his health closely as he gradually transitions back into football. He should be limited to the first quarter of games until around week six, when he can probably play an entire half, but I think it goes without saying that a full 16-game season is out of the question.” Killough added that patience would be key as even the slightest aggravation of Manning’s neck injury will most likely result in paralysis.